When will RF4CE land in Europe? Home > ZigBee > When will RF4CE land in Europe? 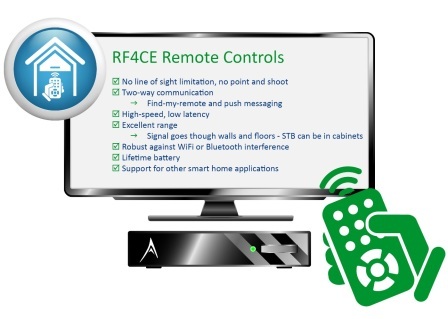 Originally developed by the consumer electronics industry to connect remote controls to TVs and DVD players, RF4CE devices have become the essential accessory for the Smart Home, and are the subject of a recently-published GreenPeak whitepaper. Within the last few years, RF4CE has become the dominant standard, adopted by all leading operators and STB/remote control makers in the USA. Worldwide, over 100m STBs and remote controls are already using ZigBee, and this number is growing rapidly. RF-technology offers many advantages over infrared - no need to aim the remote control at the device to be controlled and the ability of the signal to penetrate walls, floors and furniture. The two-way interactive capability provides ‘find-my-remote’ capabilities and provides operators with a range of exciting features where they can communicate with the end-user (i.e. sending notices of upcoming shows, special offers and even downloading software to upgrade the remote controls). With better range, better latency and much lower power consumption compared to competing solutions, ZigBee RF4CE is the best communication technology for RF remote controls. Apart from ZigBee’s networking capabilities and technical advantages over Bluetooth, ZigBee RF4CE has already won the remote control market. It is a mature technology backed by high volume expertise, used by world’s leading operators and available from a large range of providers, which makes it less expensive.